“The grave danger is to disown our neighbors. When we do so, we deny their humanity and our own humanity without realizing it; we deny ourselves, and we deny the most important Commandments of Jesus,” Francis wrote in the letter, which was dated Feb. 10 and published in Spanish. Cardinal Peter Turkson, head of the Vatican’s department for Integral Human Development, read the pope’s letter on Feb. 16 to participants at the opening of the U.S. Regional World Meeting of Popular Movements meeting in Modesto, a new event based on similar international meetings previously held in Rome and in Bolivia. The California gathering includes participants from a dozen countries. “I know that you have committed yourselves to fight for social justice, to defend our Sister Mother Earth and to stand alongside migrants. I want to reaffirm your choice,” the pope’s letter read. In his letter, Francis condemned what he dubbed a global “hypocritical attitude” toward suffering and he called for more action to address a range of social ills. Though he wrote in the letter that he was not speaking about any particular leaders but of “a social and political process that flourishes in many parts of the world” that “poses a grave danger for humanity,” the letter, delivered in a border state with a large Hispanic population, is sure to suggest tensions between church leaders and U.S. President Donald J. Trump. Last year, the pope said political leaders who propose building border walls were not Christian, a statement interpreted by the Trump campaign as a slight against the candidate. More recently, Catholic bishops in the United States have condemned several executive orders signed by Mr. Trump placing restrictions on immigration and refugee resettlement, including an executive order to move forward with plans to build a border wall. Francis also repeated his warning against describing terrorism as Islamic, another major theme of Mr. Trump’s campaign. “Christian terrorism does not exist, Jewish terrorism does not exist, and Muslim terrorism does not exist. They do not exist,” Francis wrote. “There are fundamentalist and violent individuals in all peoples and religions—and with intolerant generalizations they become stronger because they feed on hate and xenophobia,” he continued. Mr. Trump repeatedly criticized his predecessor for refusing to label acts of terror committed by Muslims “radical Islamic terrorism,” a phrase he has used often since his election. “By confronting terror with love, we work for peace,” the pope wrote. Finally, the pope reiterated his plea for believers to defend creation against exploitation, issuing a subtle warning against those who deny challenges facing the environment. Mr. Trump has called climate change a hoax and vowed to loosen federal regulations designed to protect the environment in order to support business. For his part, the pope said the time to act to protect the environment is at hand. Social justice, social justice, on and on. Thank goodness I don't rely on Francis for spiritual guidance. He is foremost a political figure. Also, no Islamic terrorism? What was it that almost killed my brother and myself on 9-11? Another reason I don't take him seriously. So you are saying that you consider the pope a heretic ("don't rely on him for spiritual guidance"), you refuse to even listen seriously to him ('obedience' (ab+audire) etmyologically means to listen seriously to), and you tantamount to said you consider yourself of a separate communion that the vicar of Christ, who was elected by an inspired Council of the Church. You have said it yourself. You cannot call this other religious identity you practice "Catholic" when you reject Catholic Social Teaching, which is essentially a systematic theology of the gospel as a whole, and you've said yourself you reject the doctrinal and spiritual guidance of the elected pope. "The conflict of rival passions and the novelty of the situation rendered understanding difficult and unanimity impossible." Unlike the Eastern Schism of 1054 which "...was a real revolt against the supreme authority of the Church..." the Western Schism "...was only a temporary misunderstanding, even though it compelled the Church for forty years to seek its true head;"
The saints themselves were divided: St. Vincent Ferrer, St. Colette and Blessed Peter of Luxembourg supported Clement V; St. Catherine of Siena, St. Catherine of Sweden, Blessed Peter of Aragon and Blessed Ursulina of Parma supported Urban VI. The idea, then, that a Pope is above criticism and even suspicion of heresy is nonsense---especially a Pope who sows as much confusion as does Francis. "I know My sheep, and My sheep know My voice," says Our Lord. When those sheep who have spent a lifetime struggling to be faithfully attentive to the Voice do not presently hear it they have a right to know why. If Francis is not a false shepherd, then he has a severe case of doctrinal laryngitis. Either way, he needs to do something about it. Personally I believe we are heading in the direction of another schism and I suggest that the Holy Spirit gave us Francis as a scourge; let's hope it doesn't take US forty years to find our true head. bergoglio is a bolshivist monster....a total devil...the vicar of george soros. I consider Francis, for lack of a better phrase, a bad Pope. He has intentionally caused confusion and ambiguity and has a bad habit of defaming those who look to the Catechism for guidance. I believe in Christ's Church and it's teachings over the last 2000 years. I do not worship the Pope, especially if he has fallen into error, eg the teaching on divorce. How he purposefully can allow confusion to reign is beyond me. The Pope challenges me--and that is good. I'm not confused. I don't find him challenging. I am challenged in that I have to choose between my Pope - who should not steer me into sinful behavior - and what I've been taught my whole life up until his Papacy. It started with the divorce question but this emphasis on each individual deciding what is Catholic truth is spreading to all moral teaching. Christ came to show us the truth. He didn't come to make suggestions. It gives me no pleasure to say a Pope is in error but I believe it is so. Respectfully, it could be that "what I've been taught my whole life" was in error. You don't identify what this was so it's difficult to know. I understand that you disagree with the Pope's take on "the divorce question" but, again, you don't provide specific theological points with which you disagree. Ditto for "this emphasis on each individual deciding what is Catholic truth is": I'm not sure if you have a disagreement with the notions of the formation of conscience or "sensus fidelium." One thing you've made clear in your MANY postings is that you really don't like Pope Francis! No, my Catholic education was not in error, and I don't believe prefacing the suggestion with "respectfully" removes it's insulting nature. First of all, many of us are familiar with the opinion of Thomas Aquinas that if a man steals a loaf of bread to feed his starving family, he is not guilty of the sin of theft, since saving his family from death by starvation is justifiable. Yet, neither St. Thomas nor any other theologian that I'm aware of---at least before the twentieth century---ever argued that stealing should be removed from the list of sinful acts, or that laws forbidding theft should be removed from our penal codes. The man who steals a loaf of bread deserves his day in court---and he should absolutely be exonerated. But he should not have Bishops and other putative do-gooders clamoring to tell their fellow countrymen that stealing is not a sin and that laws against stealing are unjust, bigoted and hateful. Yet that is exactly what our Pope and those Bishops who encourage illegal immigration and sanctuary cities are doing. What's the dictum? One may not do evil that good may come of it. Encouraging lawlessness, no matter by whom, is destructive of the civil fabric. Disloyalty to our country, on the pretext that one is following a "higher law" is preposterous. Forgiving sinners---amongst whom I consider myself a card-carrying member---is one thing. Encouraging anyone to sin is millstone-outrageous. To ignore the safety and well-being of one's own countrymen in favor of those who come here from outside is even more contemptible. Francis can eat pizza on the beach with the homeless all he likes; the day he gives them keys to the Vatican as well as a standing invitation to "stop by any time" is the day he might begin make me a believer in his posturings. Same goes for our Bishops and their own digs. This is where a person like Pope Francis loses his power in effect, when he make such 'nauseous' assertions that do not reflect the concerns of everyday people. Even far left people like Bill Maher know you can't compare Islamic extremists to 'so called' Christian ones. There is a real problem with Islamic fundamentalism across the world that seriously threaten liberal values and the safety of nations. The pope needs to stop courting the worldviews of the liberal elite and listen to the concerns of everyday people. Hilaire Belloc, back in the 1920s, predicted a coming confrontation between Islam and Christianity. I won't pretend to be a prophet; but commonsense observation and reflection has convinced me that one day Islam will be outlawed, worldwide. As a religious movement it has gone through times of dormancy and coexistence. Yet in its times of proselytizing, it has always been advanced at the point of the sword. However dormant, the irreducible impulse of Islam is dominance. Judaism promised a coming Messiah who would be called Emmanuel: God-with-us. Christianity proclaims that Jesus Christ is Emmanuel: God-with-us. Islam denies the divinity of Christ and therefore denies that He is Emmanuel: God-with-us. How can the same Holy Spirit by Whom Mary became the Mother of God-with-us, have ever inspired a religion that denies Jesus is God? Allah is not Abba. Has any Muslim ever thought of God as Abba, Father? No, because He would be a Father who has no Son. Rather, Allah is the absolute Other to whom the only proper posture is submissive obedience, not an obedience born of love, affection or any other humanly relational response. Good Muslims---and, despite Islam's principle of taqiyya (strategic lying) I'm willing to assume that there are multiple millions of them---are good in spite of Islam, not because of it. Islam is an inherently untruthful religion. "8. Whoever exalts race, or the people, or the State, or a particular form of State, or the depositories of power, or any other fundamental value of the human community - however necessary and honorable be their function in worldly things - whoever raises these notions above their standard value and divinizes them to an idolatrous level, distorts and perverts an order of the world planned and created by God; he is far from the true faith in God and from the concept of life which that faith upholds. 11. None but superficial minds could stumble into concepts of a national God, of a national religion; or attempt to lock within the frontiers of a single people, within the narrow limits of a single race, God, the Creator of the universe, King and Legislator of all nations before whose immensity they are "as a drop of a bucket" (Isaiah xI, 15)." 33. Thousands of voices ring into your ears a Gospel which has not been revealed by the Father of Heaven. Thousands of pens are wielded in the service of a Christianity, which is not of Christ. Press and wireless daily force on you productions hostile to the Faith and to the Church, impudently aggressive against whatever you should hold venerable and sacred. [...] Today, as We see you threatened with new dangers and new molestations, We say to you: If any one should preach to you a Gospel other than the one you received on the knees of a pious mother, from the lips of a believing father, or through teaching faithful to God and His Church, "let him be anathema" (Gal. i. 9)." What we are actually dealing with is a revival of fascism. The Church historically has tended to be slower to condemn fascism than communism, altho the reasons for the decision in both cases are essentially similar. Fascism pretends to be the Church's friend. In the early stages it presents itself as if it was merely sentimental old traditionalism, a matter of choices of emphasis and style and form, which it would be fair to be tolerant and open and generous to. But that was always a strategic misrepresentation, and now in its later stages when it is winning power in high places and major territorial gains, it is becoming overtly hostile to the Church, denying the gospel as such and becoming overtly heretical and schismatic. The sooner the putrid limb is amputated the greater the chances of saving the body. I appreciate the need for pastoral accompaniment as well as objectivity and clarity about the truth, but please beware of history and do not delay too long being too "moderate" (in a false equivalence sense) until they have even more critical level of control and can do even more harm than last time around in the 1930s. this is a crucifiction of the Scripture. Same as 'rewriting' the beattitudes into the image of george soros united nations agendas. In the US it is the responsibility of Congress to make the laws. If we disagree with the laws, in this case immigration, the appropriate starting point is to put pressure on Congress to change them. Protesting may get news coverage but it has almost no effect on the laws and little on the enforcement of the laws. From the standpoint of the Catholic Church, I believe the direction should be to reduce (or eliminate) barriers to migration throughout the world. Most countries have restrictions on movement of people, especially from outside, and availability of citizenship. All can come up with “good” reasons for these restrictions (mostly to preserve their culture and lifestyle). Although most complaints concerning immigrant rights are directed at the US, the US laws are relatively lax compared to many other countries. Concerning climate science, the major problem I see (which is relevant to many other areas, e.g. environmental science) is not the science itself but the misuse of selective results of the science to achieve other goals, often to the overall detriment of people and the planet (e.g., the push for diesel engines in Europe to reduce carbon dioxide emissions but at the expense of particulate air pollution and the associated health effects) or to block projects (including renewable energy sources, especially solar and wind). Terrorism should be treated as terrorism. Putting a label on it obscures the reality of it and is usually done to support other (often unrelated) objectives. Pope Francis is totally misinformed either through a failure to study and understand the situations in the Middle East, Africa and the Americas or to rely on the leftist advisers when he offers advice to President Trump on the refugee problem. 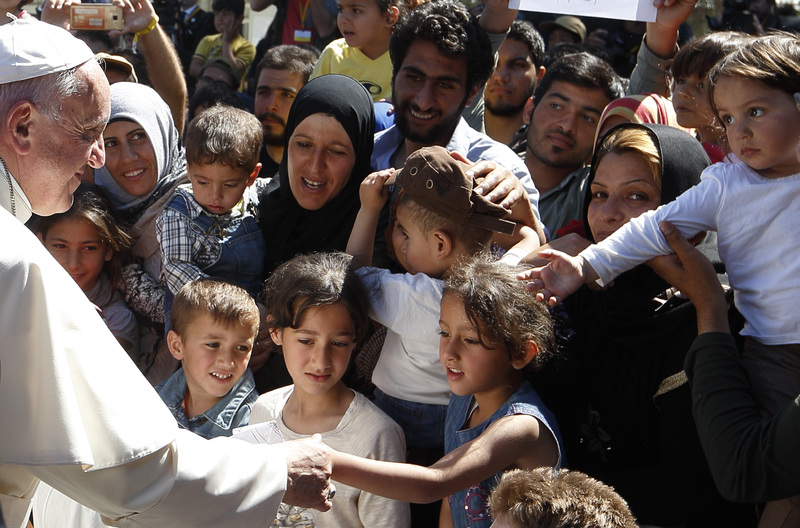 The Pope should be emphasizing that these refugees from the Middle East and Africa are fleeing from the internicine religious Sunni vs Shia warfare and homicidal Muslim hordes labeled,ISIS, Boko Haram, et al targeting non-muslims, in particular Christians, that are devastating their homelands. The refugees from Mexico, Cuba and Central/South America are fleeing corrupt politicians/government officials and vicious drug lords. And where do these homeless want to go? They are heading to those countries whose socio-economic systems the Pope condemns as "bad, unjust" and even worse. The Pope should be lecturing the leaders of those countries to improve conditions so that their citizens do not have to leave instead of calling out those countries that must absorb them. He is truly preaching a false economic message to go with his false non-science based musings on climate change. Hi Mr. Kevin Murphy, I’m pretty sure you’re Catholic, but judging from your posting, I may be wrong, but respectfully, please allow my brief response. Catholic Faith expressed as I see it assures me that when God said in the beginning, “Let Us make man in Our Image and Likeness,” among other things He was talking about the sense and reality of Social Justice as it exists in the Godhead! Everything Good exists in God. Within the Holy Trinity, the Divine Family of God, Father, Son, Holy Spirit, God’s social life must exists in Justice, another word for righteousness generated in love. Through this Divine activity the social life of God always gives whatever rightfully belongs to the Other, One to the Other without beginning, without end. This I think is why Holy Father Francis speaks so often about Social Justice, as did Jesus, its tangible equivalent being Peace, Peace on Earth to people of Good Will, It’s difficult for me to understand why you would berate the Pope for speaking often about the opportunity to participate in the “laminin” so to speak, of Trinitarian Life which holds together in an inseparable bond the Godhead, I mean Social Justice, which defines the very essence of God and shared with us by Divine generosity according to Divine Plan promoting peace and Good Will on earth. As I conclude don’t know if I managed to clearly say what I mean. I also feel it necessary to let you know I am not a theologian, just an ordinary Catholic man who knows a little about many things, but not very much about anything. Thus the personal opinion expressed above is just that, a personal opinion, so please feel free accept, or reject as you wish. Thank you for your respectful response. I am not against "social justice." What I'm against is the personification of the Church as a political entity rather than a spiritual one. I look to the Church first as my spiritual home, to bring me closer to God, to keep me on the straight and narrow, on the path to Heaven. Charity and good works are part of that straight and narrow, but do not precede my relationship with God. I recommend the book (or the excellent film of the book) Catholics by Brian Moore for a fuller treatment. God bless Pope Francis! And thank God for this Pope who demonstrates so much that is Christ-like. Hi Mr. Murphy, Thanks for taking time to respond to my post. Respectfully trying to say it again, in my opinion the Godhead is everlastingly raptured in the Peace and Good Will of Social Justice because God is a Social Being, having a societal relationship in Trinity, as Father, Son, Spirit, in perfect Justice, because whatever God is, must be perfect and just. It is an Attribute of God, One with all Divine Attributes since God cannot be dissected, a piece here, a piece there. Thus, for example, Love which God is, speaks of Social Justice which God is, because Social Justice equates Love, and speaks of God, Who is Love, one and the same. Divine Attributes inseparable one from the other, culminate in Love which as said before God is. I call my wife, “My Everything!” In truth, “God is Everybody’s Everything” and we are called to emulate what God is attributally is in all ways. We are called to be Socially Just. This is why it is of prime importance on Earth, in the Church, among all peoples, to work for and secure Social Justice for all. It the right thing to do, pulsating I suggest from within the Mind of God and in sync with the Sacred Heart Beat of the God Man, Jesus. The Gospel gives the Incarnation substantial visibility making it replete with Social Justice imperatives and as such Holy Father Francis is right on target to stress any and every Gospel initiative, which he is doing. You stress one Gospel initiative, you stress all! Sir, I cannot say it any better, already I’m afraid explained too redundantly. I’m an old man now, 85, but even from youth I always relished “wriggle room” allowing me a view of God, of His and our spiritual life, from more than one angle. God is everywhere making that endeavor easy. God is warm, not icy, free, not prisoner to anything. I hope this makes at least some sense to you. I would appreciate a link to the original speech, maybe an English translation as well. Apparently it is hard for people to distinguish between acts committed by people who claim to be Muslims and acts performed and condoned by the leaders of Islam. Of course for Islam the immediate question is who are the leaders of Islam and what are they saying. Certainly not the Wahhabi leaders in Saudi Arabia who probably suppported the 9/11 plot. The Wahhabis are even a minority in Saudi Arabia, and are an extremely small minority of Sunni's. When the Pope says there is no Islamic terrorism he is saying that there is no war by all of Islam against Christianity. The error that Michael Flynn and others make is to declare one which invites more muslims then to form negative opinions and perhaps act against Christianity. This is an error that Obama and others see and have striven against. Catholicism is in the world, we cannot have faith without acts that are consistent with or faith. We shouldn't ask for a pope that says the Rosary and then eats a big steak and guzzles a bottle of wine. Think of Mother Teresa. On a recent airplane trip while consuming lots of carbon I read Laudato Si and was quite impressed. I especially loved the prayer at the very end of encyclical. OK. After reading the article I understand what the Pope is arguing when he writes about an nonexistent "Islamic terrorism", but that does not mean "radical Islamic terrorism" (emphasis on the first word) is not a real phenomenon. To the point: it is unarguable that the Islamic faith is suffering a crisis of such a magnitude (with warmongering politicians, aiming for Hegelian conflict and synthesis in order to achieve world government, pouring kerosene on such a crisis) that not only hundreds of thousands have died because of such madness, but also Christian communities that have existed for nearly two millennia in the Middle East are in danger of disappearing. And those are two facts that I am not willing to relativize or remain silent on because of political correctness. In any case, for me, the plight of Christians is far more important than discussion on the current state of Islam, and the persecution these Christians suffer is a subject that many are perfectly fine with ignoring in order to not "offend" anybody. With respect to the environment, we all have an obligation to protect Creation. But when globalists and eugenicists want to push "global warming", "climate change" or whatever its called today in order to de-industrialize the planet, the most poor are the ones that pay the bigger price. Yes to protection of the environment; no to accepting questionable "science" as dogma for the pursuit of social justice. Finally, God bless those who work for social justice guided by the Gospel, but free us from social justice warriors that get their inspiration from toxic ideologies. The lessons of history need to be learned, remember the millions of victims of the last century. First of all, thank you for apparently being the only ostensible critic of Pope Francis to have actually read his words before commenting. Apart from that, however, it would seem that there is in existence an online echo chamber of so-called "Traditionalists" who are attempting to misrepresent Pope Francis, in order to delegitimize his papacy and force him into early retirement. These people do not represent the majority of the opinion of the faithful, and I should think it would behoove the managers of this website to check their facts before allowing them a platform. Many of the things they say about Pope Francis's management style and his approach toward the traditional teachings of the Magisterium are slanderous lies or distortions of his actual positions, and they should not be allowed to stand without detailed rebuttal. And, if there is no time for America's editorial staff to provide detailed rebuttals, then these comments should be deleted. I find some similarity between the communication style of Pope Francis and Mr Trump in that both exude supreme confidence in the things they say. The similarity ends there since, ironically, the pope makes no claim for the infallibility of everything he utters. If by stating there is no Christian, Jewish, or Muslim "terrorism" he means that no authoritative body at the center of any of these religious bodies is a sponsor of terrorism, he is right. The command to love our enemies and to offer no resistance to one who is evil stands in the way of scapegoating Islamic terrorists--who certainly exist--as THE reason for senseless hatred and violence. The pope is calling us to be holy even as God is Holy. Tradionalists, legalists, and rigorists aren't dealing well with this and, not unlike the foes of the president, look for ways to discredit and delegitimize him. I must say I'm wondering how some of the commentators found their way to this website. I thought for a moment that I was at First Things or The Wanderer. I must say I'm wondering how some of the commentators found their way to this website. I thought for a moment that I was at First Things or The Wanderer. A lot of the commenters here are from when the Jesuits taught their students to use logic and evidence in their arguments as opposed to feelings. The modern Jesuits depend on feelings for making their arguments and consequently draw many like minded commenters to this site. As an example, your understanding of Islam is at odds with what it actually is. It is no way close to what the Judeo Christian tradition is in which most of us were brought up. That is a fiction (that Islam is similar to Judaism and Christianity) that many Catholics including many authors on this website try to foster. We assume it is somehow similar but it is not. So it hard to argue for or against Islam and what is called Islamic terrorism unless one understands what the religion is about.. Actually it is much bigger than a religion. It is a political and social system in which religious precepts are embedded. The Christian principle of separating Caesar and God is not part of Islam. I have a feeling that many Catholics also would like Christianity to be a political and social system as well as a religion. Not sure what to make of this summary (I cannot seem to get the original letter online). I can see that there are political motives for denying the bleeding obvious - that is, after all, what political correctness is by definition. One doesn't want to upset a billion people, especially when the majority of victims are peaceful Muslims. Perhaps, we can say that ISIS, Al Qaeda, Boko Haram, al-Shabaab, etc., are not "real" Muslims, even though they are willing to die and go to judgment for their beliefs. And, perhaps, Pope Francis doesn't think that Sharia law (believed by millions of Muslims to be superior to all other law) is itself a form of terrorism that pervades much of Islamic-majority societies. There is also the less noble motive of self-preservation - far safer to rail against Wall Street or the rich or white supremacists, or Trump voters, or Cardinal Burke, or the average Catholic in the street (known today by the elite as Islamophobes) since the chances they will turn to violence is miniscule, whereas the non-Islamic Muslims just might. How about a new term, instead of calling them Islamic jihadi terrorists, we call them non-Islamic Muslim jihadi terrorists? As to migration, I think the prevailing politically liberal position is that migrants (at least Muslims, not so much Christians), should be welcomed by any country (although only Christian democratic nations are meant by "any" - notice there is no clamoring for the rich Gulf Arab nations to open their borders) and they should immediately be put on welfare if they cannot get jobs (seems most cannot immediately get jobs). then tax the filthy (degenerate, hell-bound - except around fund-raising time) rich to pay for them. As to climate science, I am enjoying the pleasant early Spring on the east coast. Prayers for good weather are being answered. Or, is it a curse? My comment was about adapting to the warming, not denying it. As to the degree of denial, what level of intelligence or ideology does it take to deny that ISIS and the others are inspired, to the point of their death, by a form of jihadi Islam and, indeed, are copying the very acts of violence prescribed by the Koran? I refuse to get into an argument with you because I am convinced that you literally do not even HEAR what anyone who disagrees with you is saying. However, I will tell you that I live right now in Egypt, and I KNOW that what you are saying about MOST Muslims is a pernicious and dangerous lie. Almost everyone I know here approves of Christianity and strongly DISAPPROVES of the Muslim Brotherhood, ISIS and al Qaeda. When I wear a small crucifix around my neck and it pops out of my shirtfront, veiled women in the streets smile and some even stop to tell me how beautiful it is. As to opinions of Egyptian Muslims, I have no doubt there are millions (I would say most, contrary to your insinuation in your comment) of Muslims who would not want to follow the letter of the Koran in their response to Christians. But, poll after poll reports many do believe that Sharia is the highest law, and that the just punishment of a Muslim who converts to Christianity is death. Read the following and just think about it - no need to respond http://thefederalist.com/2016/03/31/how-egypts-efforts-to-reject-sharia-law-could-spark-rebellion/. I tried to get it through your thick skull, with support of the intelligent and balanced article above, that the foreign policy of the United States--and not the modern Muslim religion--is what is contributing the most to Islamic terrorism, at least in the part of the world where I presently dwell. But you, and your FAUX-"conservative" ilk, simply will not HEAR it. Robert - so, you are claiming (through your "thick skull") that the attacks on Coptic Christians are "wildly exaggerated." I think you haven't read the links and you are completely in denial, to the point of culpability and aiding in the destruction in your midst. Do you really think that ISIS and the Muslim Brotherhood would stop killing moderate Muslims and Coptics if America just backed away from the Middle East. The Obama administration, beginning with its apology speech in Cairo, tried to do that and, rather than help the situation, it gave rise to ISIS! We are dealing with a world terror crisis at least as big as Nazism, with similar methods and violence. Apologists and appeasers are a major part of the problem. Thank you for your calm and reasoned replies to the people you engage on this site. I appreciate your approach and arguments. Actually, if you'd bother to read the article I cited, which is much more balanced and scholarly than yours, you would understand that the Obama Administration NEVER "backed away" from the "situation" that America created in the Middle East. Instead, they obfuscated in an exculpatory fashion and evaded the direct truth; the so-called "apology" was far less than an apology. Though it would appear as such to a nationalist hawk like you, it certainly did not appear as such here, because it evaded blaming the blameworthy and taking responsibility for the atrocities visited upon large numbers of people in this part of the world--which atrocities have actually CAUSED the mass migrations of various Muslim populations. You undermine everything you say by using ad hominems to demean the people you refer to in your responses. My experience is that this universally means that you do not have a valid argument, especially for one who is a teacher. Why resort to such an approach if one had all the facts on his side. I suggest you take a different approach to making your points and then we can all see if they are valid or not. So far I have not seen any valid arguments. I simply will not allow some brainwashed ignoramus to tell me that I don't see what I see all around me here, and I DON'T in the least care what you and the other warmongers writing here think about that. Robert - you used the words moron, thick skull, brainwashed ignoramus, warmongers - I understand you can only have an emotional response when trying to defend, excuse, and deny genocide. If you are a teacher, and have any students, God help them. Today I specifically chose a Coptic Christian man who speaks perfect English and who is well-educated to tell whether there was "genocide" against Copts in Egypt. He said that there were occasional, rare incidences of violence against Copts in outlying villages, that these killings were committed by infiltrating terrorists who chiefly wish to manipulate the Muslim population, that the number of people being harmed is exaggerated by both the Sisi-supporting press and the Western media outlets, and that the recent bombing of a Coptic church in Cairo was definitely an "outlier," in relations between the majority Muslim population and the Coptic ten-fifteen percent. And THIS is the sort of thing that warmongers like you want the people of America never to notice: http://forward.com/fast-forward/363765/muslims-overjoyed-as-110k-in-donations-pour-in-for-vandalized-st-louis-jewi/ And this was very similar to the response by the overwhelming majority of Muslim folk in Egypt to the bombing of the Coptic church in Cairo several months back. There is a kind of Kristallnacht pogrom going on. Of course most Egyptian Muslims want nothing of this killing or violence against the non-Muslims in their midst. Most Germans in the Weimar republic wanted nothing of Kristallnacht. But the peaceful majority could not stop the fanatical Nazis. No appeaser actually thinks they are appeasers - they just think, right to the end, that the fear is overblown, exaggerated, a "phobia". They actually fear those calling the alarm more than the actual threat. Most of the Muslims/Germans they know are nice peaceful people (even if they harbor supremacist beliefs that would shock if said aloud). Appeasers think their attackers will reduce their violence if they stay quiet, meet them half-way. that is what makes appeasers enablers. The great majority of the Sunni Muslims of Egypt do NOT "harbor supremacist beliefs." I should know, I've lived here now, for over three years, and I am now acquainted with a wide spectrum of that Egyptian population. You and your Islamophobic cohorts actually ARE a greater threat to world peace than Islam is, and the situation is not parallel with that of the 30s in Europe, because the Muslim populations of the world are much larger and much more powerful than the Jews, the gypsies, the Slavs and the homosexuals of Europe were. And these people now have to add to their grievances against the radical jihadists who are tearing their societies apart, a new regime in America, supported by haters like you, which is sewing seeds of fear and panic into the fabric of Western societies, and causing their relatives and co-religionists in the West to be harassed and terrorized on a daily basis. The Pope is right to call people like you out, and to tell other Catholics to be strong and pay you no heed. My Jesuit pastor in Alexandria, the world-renowned Father Henri Boulad, should be shown the rubbish that you write, so that he might better understand that there are war-mongering Catholics like you in the United States--individuals to whom the Beatitude "Blessed are the peacemakers" means absolutely nothing!